IMAGINE a single innovation that could help solve seven problems all at once for South Africa: an innovation that could provide off-grid power; wireless internet; public safety; job creation; fire hazard safety; blackout immunity; AND an answer to its national cable theft epidemic. In developing the world’s most advanced green street light, a small team of engineers at the Nelson Mandela Metropolitan University in South Africa have produced exactly that. Local entrepreneur, Nikolas Jankovich-Bésán, is now ready to take the award-winning Twerly to the streets of South Africa, and then on to global markets. With early interest from Cameroon to Australia - and one initial estimate of the company’s potential future value of $170 million – Jankovich-Bésán plans to launch an office and manufacturing capacity in the US within two years. Silicon Valley-based network South African Business Link to Experts is already partnering with Twerly to build the brand in the US, while also marketing its extraordinary spectrum of benefits to government officials. At a round table meeting in South Africa in February, Honorable Naledi Pandor, Minister of Science and Technology, was briefed by SABLE CEO Donovan Neale-May on scale-up pathways, including pilots and fast-track partnerships – and showed “great interest”, according to Neale-May. But he says Twerly needs only an equity investor to storm millions in revenues and improve thousands of lives and possibly save lives, given its surveillance and crime-prevention features. Hybrid street lights – featuring LED lights powered by PV panels and small vertical axis wind turbines – are a rapidly growing feature of new and off-grid developments in countries like Spain, Canada and the US. Easily recognized – and unfortunately also heard – with their little wind propellers and solar panels atop street poles, they’re generally noticed in front of progressive retail stores or on university campuses. The global market for this off-grid green technology is projected to be worth $14 billion by 2025, as municipalities and companies realize the savings of these stand-alone systems on energy and trenching costs for new developments. One North American company has already sold 6000 units. Even the famed Top Gun fighter pilot school in Nevada has a hybrid lighting system. But it’s a street light you can currently only find in a humble industrial park in East London, South Africa, which echoes – and was in fact inspired by – futuristic aerospace technology. Rather than using a noisy propeller, the Twerly is partly powered by a whisper-quiet “Savonius” rotor, which recalls the graceful shape of a DNA helix. 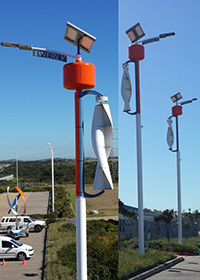 Producing power to its twin batteries in even a light breeze – 4 meters per second, the vertical axis wind turbine, together with its PV panel, can light a street for an entire night after two days with neither sun nor wind. But, for Jankovich-Bésán, it is the Twerly’s hidden technologies and potential as a modular platform for problem-solving applications which sees it stand alone in this key renewable energy field. It features the world’s smartest street light “brain” – which allows clients to control and monitor every aspect of the system, and will ultimately be able to house a miniature weather station that will collect data on rainfall, wind speeds, humidity and many other climate control statistics. This is simply Twerly’s pared-down “Version 1”, as seen on a pair of poles in East London’s Industrial Development Zone. Now, Jankovich-Bésán says customized iterations of a Version II is set to dazzle government and private investors. In addition to motion-activated video surveillance capabilities, the new system will offer self-powered Wi-Fi Mesh Networks/hotspots around each street pole in a country where internet access is both limited and crucial for development. A born entrepreneur, Jankovich-Bésán sold candy on the street in front of his Johannesburg home at age 7. He was one of the early adopters and a pioneer of South Africa’s fax-to-email industry but he says that his most exciting moment as a business developer came when he was first introduced to the basic, prototype version of Twerly by the Department of Innovation Support and Technology Transfer at the Nelson Mandela Metropolitan University. Dr Russell Phillips, a professor of engineering at NMMU, developed a wind turbine rotor with a carefully calibrated twist, which sees the Fiberglass buckets perform better the faster they spin. He said the problem for most western hybrid street light designs is that the “tip speed” was a noisy “5 to 7” ratio of the wind speed, compared to the Savonius rotor’s ratio of “about 1”. An aerospace designer and test pilot, Phillips told Sable the Twerly was “definitely inspired by my love for aeroplanes”. But he said a key innovation was Twerly’s brain, called a maximum power point tracker, built “from scratch” by Etienne Phillips, an electrical engineer at NMMU. The MPPT transmits key data about the Twerly’s functionality, from the actual light to the Database Management Solution. All of this data and more can then be viewed on the Dashboard allowing the user to track, manage and monitor each Twerly remotely, reducing costs all round. And yet the simple “Lego-style” modular design of the system meant the first two production versions of Twerly were built from scratch over just four days in a modest workshop in Cradock, in the Eastern Cape. “I’m privileged to be working with guys whom many consider to be geniuses,” says Jankovich-Bésán. Meanwhile, plans for a Version III would represent nothing less than an application revolution for renewable energy, including a remote digital graphic dashboard, and a system where lights only turn on when cars or even pedestrians approach. The current business model for Version 1 envisages municipalities installing Twerlys in new housing and industrial developments, and also replacing existing street lights when they break down. In addition to recognition in major green energy awards, Twerly has been featured as a Tech Inspiration for the UNICEF-supported “Succeed Where There’s a Need” campaign, on the causetech.net website. Globally, 150 million new street lights are projected to be erected by 2020, and 10% of these are expected to be off-grid. But South Africa’s streets, uniquely, are currently menaced by two critical energy problems: regular load-shedding from the Eskom utility, and arguably the world’s most crippling infrastructure theft industry. While the job creation potential of its outsourced component manufacture will be attractive for officials, experts say that its in these two areas that Twerly may prove irresistible to government investors. Last year, the police official in charge of combatting cable theft, Colonel Gerhard Pretorius, revealed the true scale of the epidemic for the first time to this writer: 58 000 major cable thefts every year, causing thousands of localized power outages. And Pretorius conceded that it was impossible for law enforcement to monitor or stop illegal copper exports. Already, Telkom has simply abandoned its land line service to vast farming areas and whole towns – such as Cato Ridge and Underberg – after replacing the same stolen stretches of cable multiple times. Last year, the city of Durban alone spent R72 million replacing stolen cable for street lighting and substations. Meanwhile, the chairperson of Business Against Crime said the looting of copper and aluminium cabling cost the economy “well over R10 billion” annually – while the Premier of KZN stated that “our economic development plan for KwaZulu-Natal cannot succeed without addressing this scourge”. As stand-along power producers with no cabling, Jankovich-Bésán says Twerly presents the answer. “There’s a stretch of highway near East London where cable for lighting has been stolen so regularly that its cost R10 million to replace. If you replaced the lights with Twerlys, there wouldn’t be cable to be stolen – and with integration of our surveillance technology with local security companies and police, you’d quickly dissuade or catch anyone attempting to tamper with the new Twerly Technology system”. In yet another application of crucial importance to South African government officials, Twerly has also emerged as a potential power producer which can transform the lives of the rural poor. In a recent letter to Minister Pandor, Jankovich-Bésán described how a new partnership, and a higher output “Twerly Power Tower”, could re-charge batteries used by the poor to power lights and even cooking for low income households – replacing the fire and toxicity hazards of paraffin. Nikolas Jankovich-Besan is an entrepreneur and founder with full and part ownership in a number of small businesses, including Karoo Spekboom Nursery, Jankovich Honey and Hives and Jankovich Boutique Olives and Olive Oil. In addition, he has been the Director of Operations for KEPT (Pty) Ltd; a biometrics start-up company. He has also worked as a Financial Planner in the Asset Management industry for over 20 years and holds various local and international management diplomas.